The aim of this blog is to provide a venue for discussion and collaboration about the need for, and approach to GHSIAs (as opposed to a place for me to further my views). As such, I am looking for fellow bloggers. 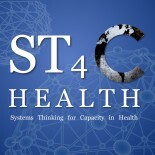 The way I see it, if we had 5-10 people total posting an average of once a month, this blog could become a vibrant, active discussion place for those interested how global health programs can plan on strengthening health systems. If interested, either comment to this post below, or email me at ghsias at gmail dot com (no spaces). This entry was posted on December 4, 2008 by chads in Announcements.